The season 2019/2020 will be Yip Wing-sie’s final season as Music Director of Hong Kong Sinfonietta. She will stay on as Conductor Emeritus of the orchestra after that. 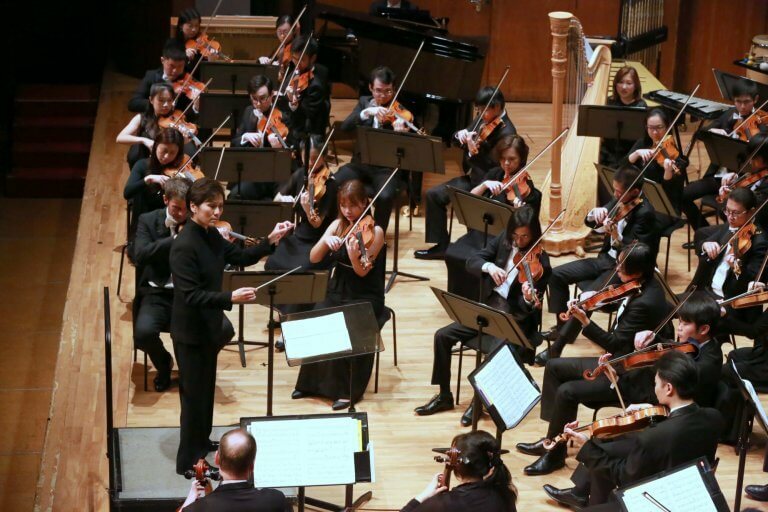 In April 2020, she will be leading Hong Kong Sinfonietta’s tour of Germany, and as Conductor Emeritus, she will be returning to conduct Hong Kong Sinfonietta. Yip Wing-sie joined Hong Kong Sinfonietta as Music Director in April 2002. In her 16 years of leadership, the orchestra has developed into an orchestra worthy of flagship status in Hong Kong. It has also started to make its mark internationally – as an orchestra with high artistry and passion for new music. She spearheaded and tailor-designed a variety of “audience development” programmes which started life as “Short-cut to Classical Music” in 2000. This soon grew to include many other programmes for audiences of different ages and levels, such as the “Know Your Classical Music” series and the “Good Music” series, which expanded into chamber concerts outside the concert hall. She commissioned close to 50 new works and projects which were premiered by Hong Kong Sinfonietta. Majority of works were by Hong Kong composers and artists. She led the orchestra in performances overseas (19 cities in Europe, 9 cities in the Americas and 10 cities in Asia). Yip will continue in her present position as Music Director until April 2020. The search of a new Music Director will start imminently with a panel comprising of the Chairman of the Board, the CEO and Yip Wing-sie (in consultation with HKS orchestra members) in accordance with the funding agreement between the Government and the orchestra. In case a new Music Director is not found by April 2020, Principal Guest Conductor Christoph Poppen has kindly agreed to take on the interim position to oversee the artistic well-being of the orchestra until the new Music Director is in place. “One of my dreams as a young conductor was to be able to have my own orchestra in Hong Kong. When the chance came in 2001 (as the Board of the Hong Kong Sinfonietta approached me), I was overwhelmed with the opportunity and accepted the offer. I learnt everything on the job – as the experience was quite different from being the Music Director at the Guangzhou Symphony Orchestra, which I was at the time. At home in Hong Kong where I grew up, it felt especially difficult at the beginning because I knew a lot of people and I was not used to being in a position of responsibility off the podium. I learnt that making decisions which were beneficial to the orchestra did not necessarily please everyone. “Looking back now, I realised that I was not only blessed with the chance to lead an orchestra but that I was actually working with a group of dedicated musicians and the solid and committed administration team, plus a supportive Board ! Not every conductor can have it all… and I think I did. This may sound cliché but it was really more than a dream come true. “2020 will be the 18th year I have been with the orchestra. I think I have built an orchestra which will stay strong and spirited, and most importantly, able to continue the good work it has been doing – to inspire the city of Hong Kong, my home. I am proud and confident that the ensemble I am handing over to the new leader of the orchestra is of an extremely high standard and with good attitude. “Yip Wing-sie is the one representative of classical music that everyone knows in Hong Kong. A true Hong Kong gift – someone who made such a difference to the musical landscape in Hong Kong! I admire and appreciate everything Wing-sie has done to make Hong Kong Sinfonietta what it is today – and although it would be hard to imagine Hong Kong Sinfonietta without Wing-sie as Music Director, I am relieved that she has agreed to remain as our Conductor Emeritus and that she will return to conduct us. Afterall, we are all from Hong Kong – and having worked together for so long, I believe that our cords cannot really be severed that easily!